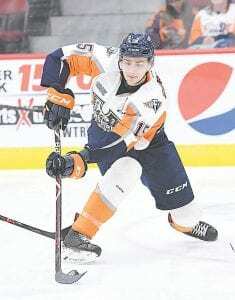 SAGINAW – An early lead and a comeback wasn’t enough for the Flint Firebirds to hold on during Saturday’s 6-4 loss at the Saginaw Spirit. Ethan Keppen put Flint on the board early, while Jacob Winterton upped it to a 2-0 lead, an advantage the Firebirds didn’t hold onto for long. In the next few minutes, a pair of Saginaw goals tied it up heading into the first intermission, and the scoring didn’t slow down in the second frame. The Spirit scored twice more in the first 11 minutes of the stanza to go up 4-2. That’s when Flint decided to come back with Keppen getting his second of the night. Eric Uba tied it up in the final few minutes of the frame, but a Saginaw tally with 56 seconds left in the middle stanza put it up 5-4 heading into the third, where the Spirit netted the only goal of the period. Flint also couldn’t keep pace in a 4-2 loss to Saginaw at home on Friday. The Spirit scored three times in the first period before Flint finally answered with a Keppen goal early in the second. Saginaw made it a 4-1 game heading into the third, where Jack Wismer got the lone goal of the period. The Firebirds are still in last place at 9-40-3-0 for 21 points. They’ll be at North Bay on Thursday, at Sudbury on Friday and at Barrie on Saturday.